Today, the cousin and I went to Livermore Outlets for Black Friday shopping from 8am to 3pm…! Then we met up with the rest of the family at Mitsuwa in San Jose. The two of us only had a banana and some quick bites the entire day, so we had our late lunch / pre-dinner at Santouka! 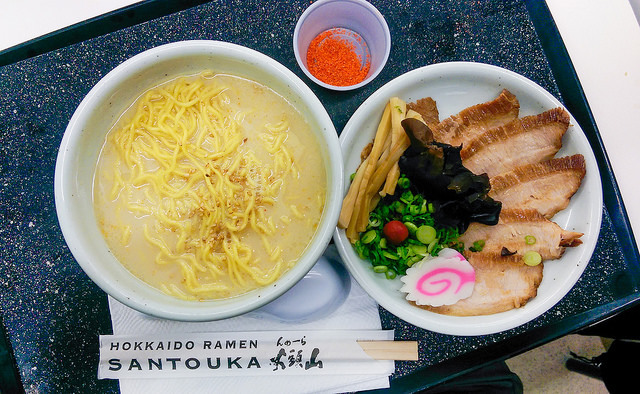 Santouka is a ramen chain based in Japan, with many locations across the world. There is only one location in the SF Bay Area while there are a few in SoCal. The line was short when we got to Santouka, but the line got much longer after we put down our order! Toroniku Ramen is our signature ramen which has the toppings served separately. Toroniku Cha-shu is simmered pork cheek (jowl) meat. Pork cheek meat is very rare and only 200-300g can be taken from each pig. It has a very rich flavour and it is tender like fatty tuna. The toppings included pickled plum, green onions, menma (bamboo shoot), kikurage (wood ear mushroom), narutomaki (fish paste) and cha-shu (pork). The Toroniku is served separate from the Ramen and the proper way to eat it is to soak the slice of Chashu into the hot soup so that the fats start to melt before you place it between your tongue and palate to dissolve. Pork cheek is actually very tough because it is a very well exercised muscle since pigs are always piggin’ out. It was considered a cheap cut of meat until someone discovered that if it was cooked slowly over a long time, those tough strands break down into something gorgeously gelatinous and velvety which is unlike any other part of the pig. The Toroniku can be slightly salty if it were just eaten off the plate. But when you leave it in the broth for a while, it adds an extra kick to your soup while at the same time warming up to the consistency of melting butter. As far as I can see, everyone treats their Toroniku with the same respect as they would with a slice of Otoro (Tuna Belly). Of the three different soups, Shio, Shoyu and Miso, the most popular is the Shio. The Shio is essentially their Tonkotsu based soup with salt. This Tonkotsu based soup is slightly different from the standard Kyushu variety in that it is sweeter because of the addition of seafood in the soup base. This gives the Shio a bit of character and depth of flavour. The manager here also tells me that they use Kurobuta (Black Pig) pork bones which are imported from the US to boil the soup! Ahso! That’s why the soup is so shiok! This was actually my second time eating at Santouka. The first time I had the shio ramen (salt base) and didn’t like it because it was too salty for my taste. This time, I loved the Tokusen Toroniku ramen. I am a slow eater, and really liked how the pork was separated so it wouldn’t get soggy by the time I’d get to it. The taste of the soup also stayed the same from beginning to end because the juice from the ingredients wouldn’t seep into the soup. looks yummy!! i have been there several times and each time, the line, at least for me, has been too long. i need to catch it when it is not so busy. (so, i usually go around the corner (w/in Mitsuwa) and get their ramen. will have to be patient and try it! !